if you guys could be dolls and tweet this for me it would be so appreciated! 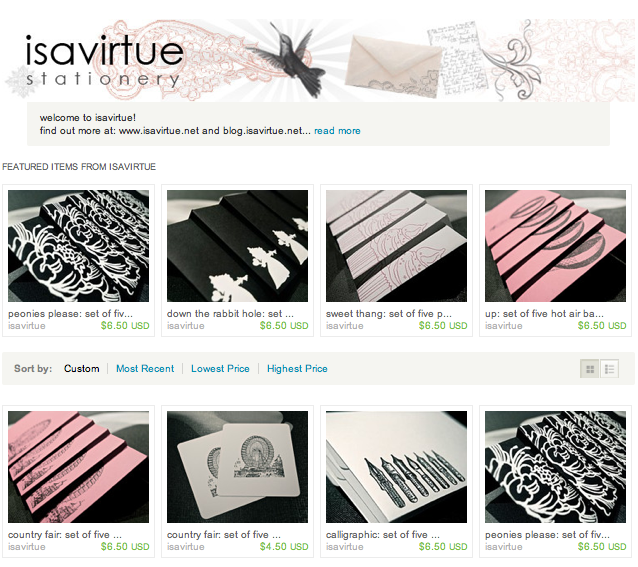 isavirtue readers, i don't believe you have met so i would like to formally introduce you to "isavirtue stationery". in my isavirtue etsy shop i sell the kind of stationery that makes it easy for you to write a letter. my products include envelopes, writing paper, journals and envelope seals - all you need is the stamp! i sometimes make cards for custom orders (such as invitations or christmas cards because i'm wary of the e-invite trend and adore the tradition of filling a mantle with real christmas cards). however, i believe writing paper is more conducive to a heartfelt words and has more room for your sentiments. cards sometimes feel obligatory and people don't generally write more than a few lines within them. there is something about writing paper, inside of a handmade envelope that screams "i care about you and this occasion is special!" i don't think letter writing needs to be a dying art. we should always take that extra step (whether it be sending a letter, handwriting our thoughts, giving notes on non-occasions or purchasing handcrafted items) to show that our intentions towards our friends, family and loved ones are true and meaningful. i am currently designing my stationery in a black and white palette with hints of 'kraft' but do plan to expand in the future (perhaps with some pink?). i think the contrast of black and white is very striking, modern and aesthetically pleasing. i try to use images that are simple, bold and eye-catching. i am very proud of my little shop, and i hope you will find the time to visit! Those look great! I shall be visiting your shop for my future stationary needs. Well done. oh! i love writing letters :) your lil shop is so cool. I'll def. check out your shop whenever i need stationery.